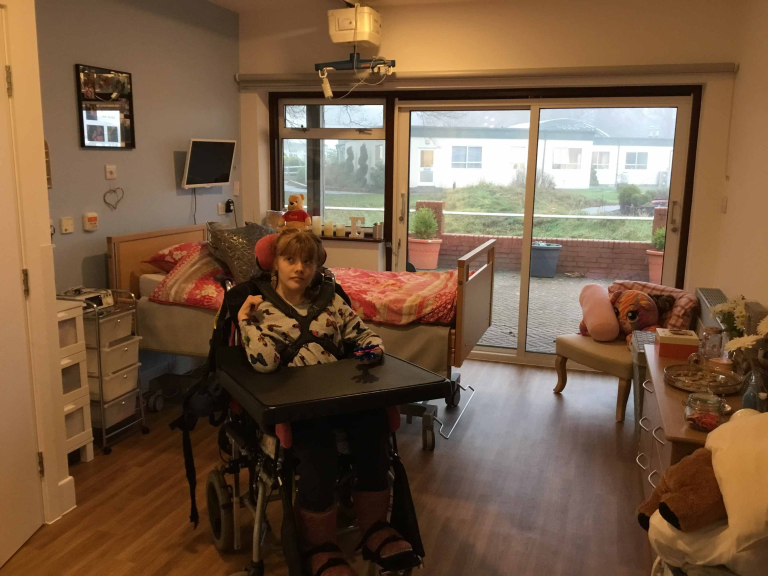 Living space for children with brain injury and neurodisability has been transformed thanks to a £44,000 donation from The Kingswood Arms Golf Society and donations from generous supporters of The Children’s Trust. Willow House, where children live while attending The Children’s Trust School for children with complex needs, has been completely refurbished thanks to donations from several generous supporters including Kingswood Arms Golf Society. The residential house has been fitted with a new accessible kitchen dining area and four new bathrooms whilst the lounge and bedrooms have been brightened up with engaging artwork, mood lighting and new flooring. Liz’s daughter, Emily has been a resident at Willow House for the past four years. Liz says: “It looks stunning. The flooring is easier to keep clean but gives it still a warm feeling. The colour scheme gives it a very modern look, perfect for the age of children and young people living there. The ceiling picture of the sky and kite is so wonderful and perfect for them to look at if they are unwell and in bed. It’s great when it lights up too. The kitchen is a big wow too – so spacious. The island is great for the young people to get involved with cookery in their wheelchairs”. ‎ Every year 40,000 children in the UK are left with a brain injury as a result of an accident or illness and many have to live with ongoing, long-term difficulties. The Children’s Trust gives children and young people with brain injury and neurodisability opportunities to live the best life possible, by providing specialist rehabilitation, education and community services across the UK.